As our interview continues, Linda describes how Inklingo takes us back to our traditional quilting roots. Generations Quilt Patterns (GQP): In a world where everything is “I want it now”, you've kept to hand piecing, why is that? Linda Franz: Thank you for the opportunity to clear up two misunderstandings! I also machine piece and applique! Hand piecing IS for quilters who want it now. If I waited until I had time to spend an hour at the sewing machine, it would never happen. With hand piecing, I can have it now. I can sew when I only have a few minutes, or when I am watching Pride and Prejudice (1980) or Persuasion (1995, Armada Root), or when I am a passenger in the car. Hand piecing is for busy people, especially since it is portable. If I hand piece, I want it to be a design that requires it, like something with intricate shapes or inset seams. I would only hand piece a nine-patch if it had to be portable. I would be disappointed if I was taught how to hand piece with a nine-patch and then found out that I could have made just as good a block in 5 minutes by machine. I would feel cheated if a teacher pretended that hand piecing was the best way for everything. GQP: Where did the idea for Inklingo come from? 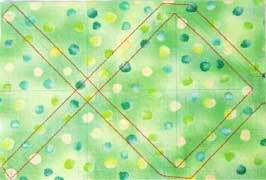 Linda: When I was teaching hand piecing with freezer paper templates from my Quilted Diamonds books, I met many quilters who loved the idea of a portable project, but were frustrated by the preparation, or who drew lines on the fabric with big, heavy, inaccurate lines. I wanted to find a better way to get stitching lines on the fabric, so more quilters could enjoy the benefits of hand piecing. I tried rubber stamps, and other templates and methods, but Inklingo was the best by far. The wonderful thing is that it also applies to machine piecing and applique. GQP: For our readers who aren’t familiar with Inklingo, could you give us a quick overview? Linda: The shape collections (patent pending) are big PDFs, which we use to print shapes on the wrong side of the fabric with any ordinary ink jet printer. The lines are ultra-fine and provided in colors that are most likely to wash out of the fabric, and not show in the finished quilt. It is simple to use because it uses Adobe Reader software, which is already on your computer. With the cutting lines, stitching lines, matching marks, and cross hairs printed quickly and accurately on the fabric itself, there is no measuring, and no need for templates, and everything is perfect and on straight grain. It is that simple, but there is video and more information on my website. GQP: Drawn stitching lines for the hand piecer make sense. 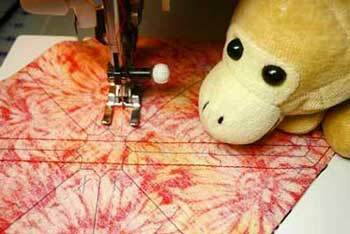 Why is the printed sewing line for machine piecing so advantageous? Linda: I have never had a hard time convincing machine piecers of the advantages of having the cutting and sewing lines printed on the fabric. We have always preferred having lines to guide us. Since the introduction of the rotary cutter, many rulers, acrylic templates, and techniques have helped us compensate for not having a line on the fabric, so I think Inklingo had to be invented by a hand piecer, but the advantages for machine piecing and applique are even more significant. You could actually say that Inklingo on your computer takes us back to traditional quilting, before the rotary cutter, when quilters drew all of their shapes on fabric! We use these digital templates instead of cereal box cardboard, and cut with a rotary cutter instead of scissors. Not only that, but Inklingo uses fabric very efficiently, so it is in tune with the frugal habits of our quilting ancestors. 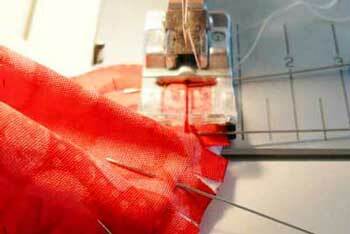 When you are stitching curves, having the matching marks printed on the fabric helps with pinning and stitching. For curves, the cutting lines and registration marks are probably even more important than the stitching lines. Cutting curves is a breeze with the lines printed on the fabric. Just follow the cutting line with your rotary cutter. NO measuring! Many quilters use triangle papers for half square and quarter square triangles, or draw lines on the fabric, or paper piece. Inklingo has more advantages, without the paper or the disadvantages. For Inklingo half square triangles, we print one of the two fabrics, layer it with unprinted fabric, stitch on the diagonal dashed lines, and cut on the solid lines. Every triangle is perfect, the corners are precise with no dog ears, and the stretchy bias seam is sewn before the fabric is cut. It is ideal for scrappy quilts. Sew precise half square triangles without any paper to remove. Machine piecers want that line so badly, they are willing to put up with all the disadvantages of paper piecing—sewing on paper instead of fabric (many quilters prefer the feel of fabric), having to follow complicated numbered diagrams, working backwards with mirror image, working in a messy nest of unusable scraps and wasting fabric, having straight grain in all the wrong places, and worst of all, picking the paper off afterward. There is a free 16 page PDF called "Triangle Tips" under the 'Machine Piecing' tab at Inklingo.com. See how perfect it is for Flying Geese, Quarter Square Triangles (QST), Half Rectangle Triangles (HRT), Snowball, and all other triangle shapes. 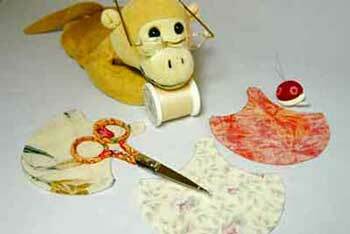 GQP: How does Inklingo differ from paper piecing? Linda: Monkey says, please see above. If we didn’t want that line to sew on, who would put up with it? Paper piecing sounded great to me “in theory” but it is my least favorite method. Inklingo prints ultra fine lines on the fabric itself, so it has all the advantages (precision) with none of the downside of paper piecing. For many quilters, the main attraction of paper piecing is that it gives us a line to sew along for precise results. How much better to have the line on the fabric, than to sew through paper! Paper piecing will always be a good method for certain designs, but for most quilting shapes, it is better to have the lines on the fabric itself.